Yes, its rainy, windy and sometimes snowy. The ground is too soggy for digging. But that doesn't mean there aren't plenty of satisfying gardening activities to enjoy. Here's a list. 1. Make your plan for this year's garden. What worked well last year? What do you want to change this year? Are there things you've never tried before that sound interesting? This is the time of year to do research. Go to your local nursery. Look at what they have available. Ask questions. Get catalogs from companies like Territorial Seed and Raintree Nursery, both places that sell seeds and plants that are well adapted to our climate. 2. Select winter blooming plants for your garden. It is too wet to plant right now, but you can buy the plants you want now and plant them later. Why buy them now? Right now, you can see what the flower color is on certain camellias, hellebores and witch hazels. Plants are not all created equal. Color, and with the witch hazels, fragrance, can vary from one to another. If you buy the plant in bloom, you know what you are getting. Later in the season, when the bloom has faded, it will be too late to tell. 3. Get your winter pruning done. Winter is when you prune deciduous trees and shrubs. The plants are dormant now and pruning isn't as hard on them as it will be later in the year. Also, without leaves, it is much easier to see the plant's framework and make cuts that are more aesthetically pleasing. Use sharp tools and clean the blades often with alcohol to keep from spreading diseases from one plant to another. Before pruning be sure to consult a guide for proper pruning. Pruning & Training is the best guide I have found. It is comprehensive and well-illustrated. Do not prune late winter/spring flowering shrubs like rhododendrons, azaleas or camellias right now. If you do, you will cut off the flower buds and you won't have any bloom this year. Wait until after they've flowered. 4. This is the time of year for dormant oil spraying. This is an effective, non-toxic (at least to humans, fish, birds and pets) method of dealing with certain insects and fungal diseases. You spray the oil-water mixture onto susceptible trees and plants (e.g. apples, cherries, hawthornes, roses) before they leaf out. The thin coating of oil smothers any over-wintering insect larvae, thus substantially reducing insect problems in the coming season. Sulphur is often added to the mix to kill fungal spores. The oil and pump sprayers are available at garden centers. 5. Visit the Winter Garden at the Washington Park Arboretum. 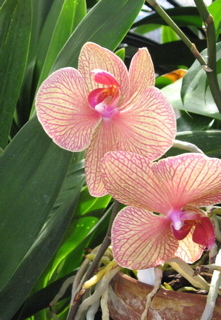 Its fine to read about plants in books and visit nurseries to see what they look like "new." But to get a real sense of what plants are like in the landscape, it really helps to see mature plantings. Bundle up and take a walk in the park in late January, early February, and see the hellebores, heathers, and silk tassels. Take in the fragrance of witch hazels, sarcococca and winter daphne. This will lift your spirits and possibly give you a new appreciation for wintertime. 6. Take a mini-vacation at the Volunteer Park Conservatory. The greenhouse complex is modeled on London's famous Crystal Palace. But the interior will make you feel like you are in a tropical paradise with orchids, bromeliads and epiphytes. The Conservatory is an especially lovely destination on a cold, rainy day. Although there's no charge to visit, be sure to drop a donation in the box to help assure that during this tough time for the city budget this gem can remain open. 7. Don't miss the Northwest Flower and Garden Show. This show runs every year in February at the Washington State Convention Center. Do Trees REALLY Prevent Mudslides? What the Heck is a Joshua Tree?